CS: Welcome to CSReview, Monique. Let’s talk about NYPDM, a web series that you and Nick Rossier have worked on. First of all, what attracted you in the script that you decided to produce the series? Monique Yamaguchi: I thought the mix of genres would be great to see on screen and was excited when Hal Jordan brought up the prospect of writing the script. CS: Events in the series take place in New York, a city with a social climate of its own, a very unique and recognizable atmosphere. What would you say was most challenging during the filming and production of the series in terms of modeling the setting for NYPDM and re-creating the feel of the city? Monique Yamaguchi: We were definitely concerned about re-creating such a well known environment, but as luck would have it, meteorologists in the Los Angeles area announced a few days before us starting principal photography that we would be hit by “The Storm of the Century,” which was a rarity since it generally does not rain in Los Angeles and especially with that kind of intensity or for that length of time. We thought the rain was going to be a setback for production, but it turned out to be quite the contrary if anything-the rain that we met with that first day of shooting became the establishing look for the show. 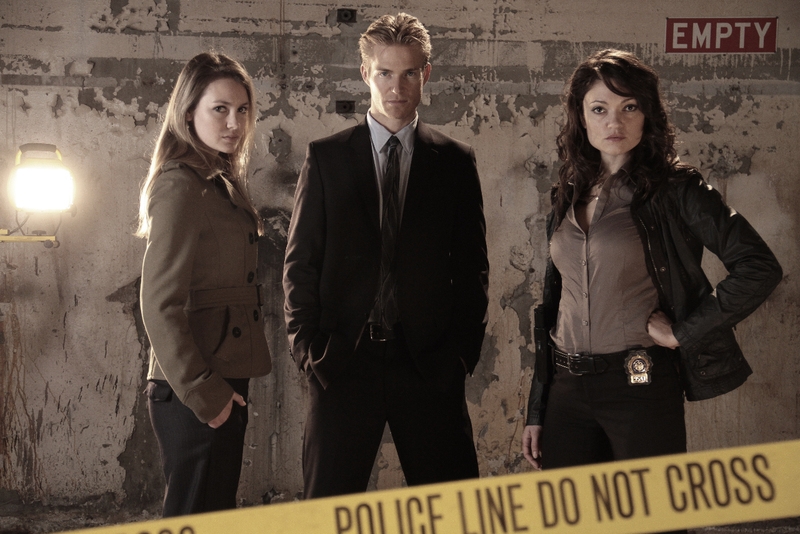 CS: Talk about a lucky accident… How would you describe the cast and crew of NYPDM and the cooperation on the set? Monique Yamaguchi: Just amazing. We had to overcome all kinds of obstacles with the weather, but there was never a moment when the cast and the crew did not come together to make sure everyone was safe and comfortable. We truly had an amazing cast. Actress Jamie Bernadette got into a pool towards the end of principal photography that was about thirty degrees, actress Grace Bannon laid down in an abandoned pool in the pouring rain where umbrellas barely provided shelter for the actors standing around her, and leads Janelle Giumarra and Jilon VanOver spent every shoot day in either rain or cold and sometimes both. NYPDM: Shooting during "The Storm of the Century"
CS: The horror genre, supernatural elements, crime, mystery to solve and an evolving drama…What is essential for putting all these components together into a well paced and engaging product, designed specifically for the web television? Monique Yamaguchi: This is not possible without a good story. Director Hal Jordan was able to hold on to his vision from pre-production all the way to post-production. 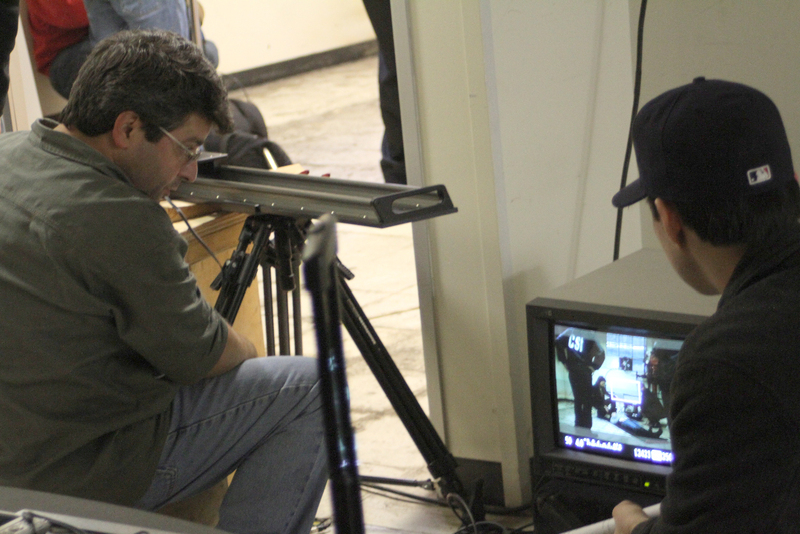 Director of Photography, AJ Raitano who incidentally happens to be a transplant out of New York, was then able to take Hal’s script and bring it to life. All in all, Hal did an amazing job of adapting the traditional episodic television structure to the three minute episodic format of the web. CS: The trailer alone is a testimony of all your collective hard work-I can’t wait to see the first episode! Monique, what appeals to you as producer in making content for web television, this new medium that is becoming quite popular quite quickly? Monique Yamaguchi: I think it’s filmmakers’ second nature to explore and utilize mediums that become available to them so they can share their stories and ideas with the world, and web television certainly allows that. It’s exciting to work with these up-and-coming directors to see their visions come to life with immediacy as they are able to create original content, and distribute their work shortly thereafter. CS: Speaking of technology, what innovations have been used for NYPDM? Monique Yamaguchi: Technology has allowed our production to utilize members of our crew that are not based in Los Angeles. Our sound designer Adam Hawk for example is now based in Texas, our titles and graphics designer Anthony Hahn works out of Hawaii and Kyle Walling, our second unit director of photography/camera operator, was out of New York. CS: Last but not least, what can we expect of NYPDM when the show goes on air? Monique Yamaguchi: An amazing quality show that delivers every episode that we hope will leave viewers wanting to see a Season Two. CS: Wonderful! Thank you for sharing NYPDM’s behind-the-scenes story with CSReview. 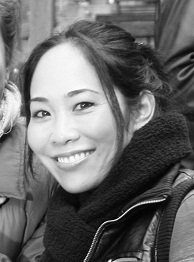 Monique Yamaguchi, graduate of USC School of Cinematic Arts, produced over three dozens films, shows, web series and music videos. Copyright Camilla Stein ©2011. All rights reserved.